Product code: T966 Categories: Sold Items, Sold Jewellery, Sold Rings. Nothing beats a genuine antique ring, and here is a very beautiful antique 18ct gold cluster ring set with European cut diamonds. Dating from the late 1800’s, in the centre is a vibrant antique European cut diamond that is surrounded and highlighted by a further seven European cut diamonds. Antique European cut diamonds have certainly increased in popularity in recent years, so much so that modern version of the European cut diamonds are being cut today, however nothing beats a genuine antique cut diamond, and are a popular choice for engagement rings. The centre diamond weighs 0.45 carats and the surrounding diamonds come together to total 1.75 carats and the cluster of diamonds itself measures 12.1mm in diameter. The band itself is charming with split shoulders that adds an extra element of character, and this is a style of ring that would suit a multitude of occasions, including making such a wonderful engagement ring. Regardless of which finger it is worn on, there is no doubt that it will always be loved, admired and cherished. Tags: Antique diamond engagement ring, Antique diamond ring. This antique diamond engagement ring is set with eight European cut diamonds. The European cut diamond was the forerunner to today’s modern round brilliant cut diamond. While both have fifty eight facets (cuts), the angles on the European cut diamond are often steeper than that of the round brilliant cut. Today diamonds are being once again cut in the European cut, however there is nothing quite like a genuine antique cut diamond to sit on your finger. Not only are they the original and genuine antique cut diamonds, but the antique ones are also 100% conflict free. 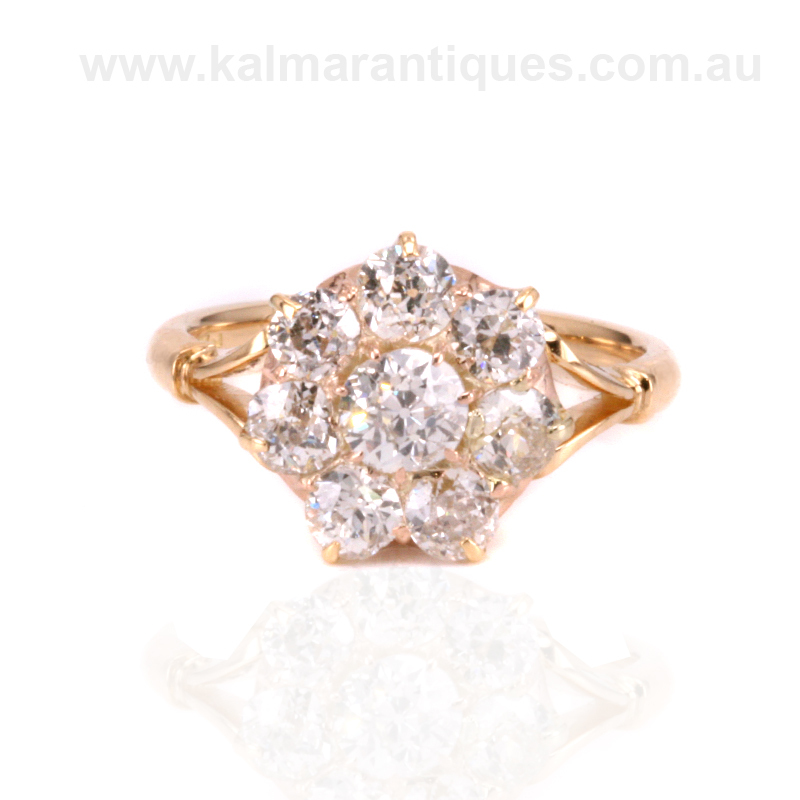 This antique diamond cluster ring was hand made in 18 carat gold and would make a perfect example of an antique diamond engagement ring that will always be loved.